Tanzania Dairy Board communication workshop participants. The Tanzania Dairy board (TDB) and partners recently reviewed progress in communicating the activities of the Dairy Development Forum (DDF) across the country. 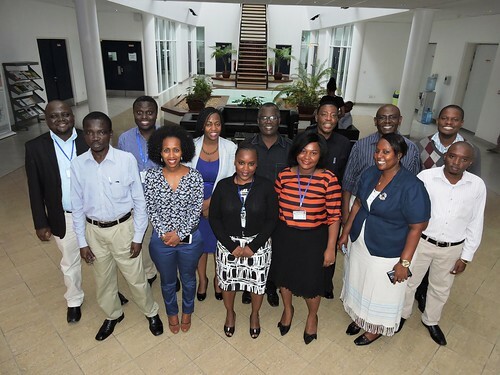 In a communication review workshop held in Dar es Salaam on 28-29 March 2016, 16 staff and partners of the TDB, expressed the need to revamp TDB’s communication strategy following a strengths, weaknesses, opportunities and threats (SWOT) analysis, and agreed on an action plan to guide implementation of TDB communication activities in the coming year. The action plan will address among other priorities increasing capacity for resource mobilization, and creating a robust database for an information management system. The Dairy Development Forum (DDF) is the national platform where value chain actors including producers, traders, input suppliers, extension workers, service providers and processors meet annually to network, exchange information, discuss problems facing the sector, and come up with solutions to those problems. TDB is the secretariat of the DDF and in this role coordinates the platform, which was set up with the support of the Irish Aid-funded MoreMilkiT project that is being led by ILRI in the country. Improving communications among DDF members is considered crucial to the realization of a vibrant dairy sector and attracting more investments to transform it as envisaged in the Maziwa Zaidi Theory of Change. TDB now pays the main role in efforts to strengthen the DDF and this is expected to continue after the end of the MoreMilkiT project. . The DDF has provided TDB with additional ammunition to mobilize, coordinate and promote the dairy sector in line with TDB’s statutory role in the Dairy Industry Act of Tanzania . The MoreMilkiT project is also working with other partners including Heifer International, Sokoine University of Agriculture and Faida MaLi to test interventions aimed at promoting commercialization of dairying among marginalized cattle producers in Tanga and Morogoro. Some of the key outputs discussed at the meeting were a new TDB website which will include information on the Dairy Development Forum (DDF), a resource mobilization strategy to guide fundraising activities of the board and a dairy value chain partners’ information database that will be set up in the second half of 2016. The meeting was facilitated by the International Livestock Research Institute (ILRI) and was attended by representatives from Tanzania Milk Processors’ Association (TAMPA), Heifer International and Tanzania Milk Producers Association (TAMPRODA). This was a follow up to an earlier workshop in May 2014. Tags: MoreMilkiT. Bookmark the permalink. It is really a great effort and I hope it will bring cool breeze in the dairy industry of Tanzania. I would like to have this opportunity to suggest camel as a dairy animal. This hardy animal produce up to 15 liter a day in ordinary grazing conditions in Pakistan.